TEAM boss Dale Allitt urged King’s Lynn to quickly banish the memory of a testing 53-37 defeat to Somerset in the Knockout Cup final first leg. The Tru Plant Stars head into Thursday’s decisive second part at the Adrian Flux Arena (7.30) with it all to do despite a mid-meeting fightback that saw them close to within four points of the Rebels. Guest Charles Wright was Somerset’s star turn, scoring 11-paid-12 on his return to the club he left after more than five years earlier this season. Reserve Nico Covatti top scored with four paid wins. But with home advantage always likely to be key in both meetings, Allitt remains bullish over his team’s chances back at basecamp. “We will come out fighting, definitely,” he said. “The 16-point gap is what it is and we know what we have to do at our place. All we can do is forget what happened in the first leg and focus on what we can do. “There are no excuses. We cannot dwell on what went right or wrong, no one is pointing the finger of blame, we just have to fight back. “We have not given up. People will look at it and ironically the gap is the same as the play-off final against Poole but it is doable. Jason Doyle trapped with Jake Allen filing in behind from gate one to give Somerset the perfect start but the Stars responded through Simon Lambert roaring out of gate three and guest Tero Aarnio surviving a lap-two lift to hold off Covatti. Thomas Jorgensen pressed Wright all the way in a shared third but Simon Lambert got pushed out by Chris Harris with Covatti steaming through for a second home maximum. Wright made light work of heat five with Lawson pressing Riss for second while Robert Lambert's bad start resulted in a rare duck for the number one. Doyle led from the off in the sixth only for Niels-Kristian Iversen to have the last laugh, soaring around the outside on the final turn of lap three. That feat was repeated in the seventh but it spelled trouble for King's Lynn with Allen's blast around the boards leading a 5-1 with Covatti, a replacement after Chris Harris had missed the two minutes. Wright tried the outside run around Riss but suffered a horrible spill, although that man Covatti prevented the visitors making any inroads by blasting up the inside to win having been held at the back by Simon Lambert in the first two turns. Iversen was flanked by Rebels and ran to the wire by Allen but stood firm for another 3-3 in the ninth. Jorgensen appeared to get away with a jump to win a nip-and-tuck tussle ahead of Doyle with Ty Proctor third, reducing to eight points the arrears. That gap was sliced in half courtesy of Robert Lambert and Riss giving no hope to their rivals in the 11th only for Wright to return with a forceful ride, guiding wide Aarnio as Somerset hit back with a 5-1. Heat 13 lived up to its billing with Harris eventually picking off Iversen and Doyle overhauling Robert Lambert at the back on the final lap. Jorgensen seized the lead in the penultimate race bit got reeled in by Lawson as the Stars slipped further behind with Doyle and Wright cruising to a potentially-decisive maximum as Robert Lambert stalled in heat 15. 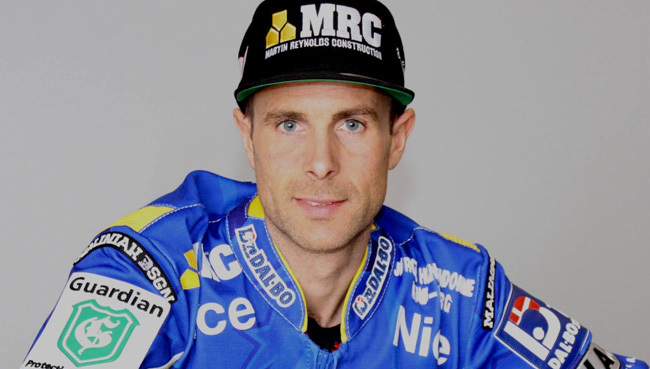 SOMERSET 53: Nico Covatti 12+3, Charles Wright 11+1, Jason Doyle 11, Jake Allen 8+1, Chris Harris 6+1, Richard Lawson 5+1, Aaron Summers r/r. KING’S LYNN 37: Niels-Kristian Iversen 10, Thomas Jorgensen 7, Erik Riss 6+1, Ty Proctor 4+1, Simon Lambert 4+1, Robert Lambert 4, Tero Aarnio 2+1.